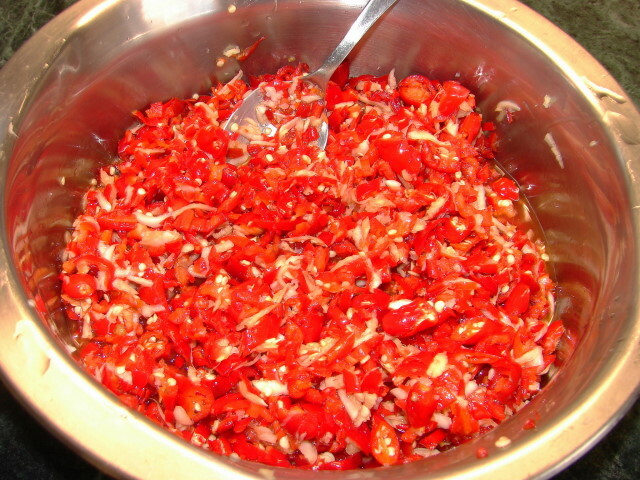 Duò jiāo 剁椒 is a pickled/fermented chopped chilli popular in Hunan and Sichuan. It does not contain any vinegar but lactic acid is produced during fermentation. This pickle is easy to make at home and ready to eat after few days but if you like it tastes sour best keep it for 2 - 3 weeks before use. This pickled/fermented chilli is a popular ingredient for steamed fish especially fish head. Take a look at these pictures don't they look appetising. Here is the recipe if you like to try at home. I preferred to use red chillies you can use green if you like the flavour is different or a mixture of red and green. Green chillies will lose its vibrant green colour to olive green. * For the chillies I used a mixture of large red chillies easily available in supermarkets and some hot small red Thai chillies. You can use any chillies you like, mild to super hot to your taste. Good to use up any home grown chillies. ** If you don't like too much seeds, put the chopped chillies in a small colander few tbsp at a time, give it a good shake the seeds will fall out. Best do this in the kitchen sink, so the seed can be removed easily. Do wear gloves when handling large amount of chillies. Chop the chilli chunky or fine. I chopped the chillies by hand you can chop in the food processor use the pulse button and do not blend the chillies into paste. Pack the mixture into a clean dry jar leave some space for expansion during fermentation. Smooth the top surface of the chilli mixture with a spoon. Wipe clean the neck of the jar. Put on the jar lid (not too tight to let gas to escape during fermentation) or covered with cling flim. Leave the chilli at at room temperature to ferment. If the room temperature is very warm about 24 - 36hours or cold room up to 3 - 4 days. Then keep in the fridge up to 6 - 8 weeks, so long as it is not mouldy. 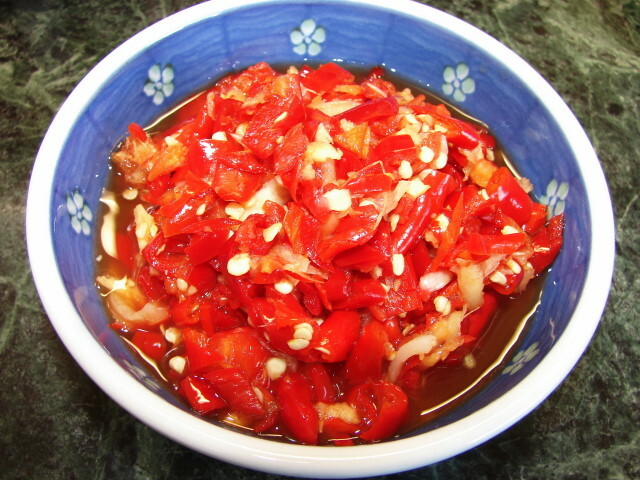 This pickled/fermented chillies is ready to eat from 4 - 5 days. The longer you keep it the chillies will become softer, more mellow in flavour and more sour. 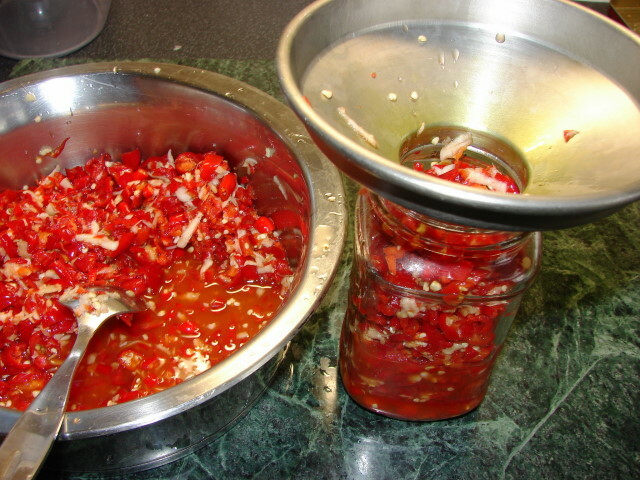 For this batch I used about 470g of chillies, filled up 2 x 1lb jars. I left it on the worktop for 3 days before putting in the fridge. Uses: Steamed fish, steamed tofu with pork, fish paste or prawn paste, steamed ribs with black beans. Can use in any other cooking you wish. Good as a condiment too eaten with jiaozi dumplings. Lovely recipe...I am going to try this for my Christmas dinner...thanks. Merry Christmas and Happy New Year to you and your loved ones. Will have to give these a go again. I tried the recipe in Fuchsia Dunlop's Hunanese book but they went mouldy before I got around to using them. This sure looks very spicy but once tasted, will give a softer spice with a hint of sourness. Merry Christmas & Happy New Year to you & family. I am going to enjoy some of your chilis with a nice rice wine (also found on your site). Thanks!